Make sure to checkout my Table Top Review for the Umarex Legends Makarov Ultra! My last CO2 Blowback 4.5mm Steel BB Pistol Field Test Review from my latest acquisitions of New Umarex Air pistols. 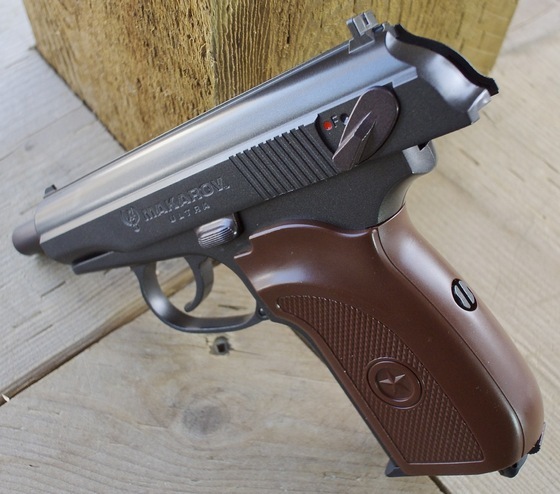 For many people that already liked the Umarex Makarov CO2 BB pistol, the Umarex Legends Makarov blowback version may just have everything you where looking for that was missing from version One? Well let's see... It has blowback - check! It has a working slide catch/release - check! It has a full size dropout metal magazine - check! And it's still all metal, field strip-able and has single a single action trigger! Sounds pretty good so far... So how does the Umarex Makarov Ultra CO2 Blowback 4.5mm Steel BB Pistol shoot? Well like the other new Umarex CO2 Blowback BB pistols I just tested, the Beretta 84 FS and the Mauser C96, I was not disappointed. As per usual, I tested the Umarex Makarov Ultra out shooting 5 rounds through my Chronograph with a new CO2 to find out the real world fps performance. Umarex claims 350 fps and I got pretty close to this at an average of 333 fps and I would have to say the temperature was no more than 10-15 Degrees Celsius (50-60 Fahrenheit) so there is definite room for improvement on a warmer day. Next I stepped back 30 feet and shot 10 rounds at my paper target using a semi rested position (Standing in the back, rested on a sand bag in the front). After review of the video I noticed that the first shot was a double shot and both of these rounds hit a bit to the right compared to the remaining single shots, so my grouping ended up being more of a 2 inch group rather than a 1.5 inch group when discarding the double shot from this test. I have to say I really like shooting the Umarex Legends Series Makarov Ultra, it has really solid blowback, a pretty decent single action trigger even if it is a bit long travel. I also found the accuracy to be very respectable from 30 feet out and the fps even though it could be a bit higher is more than enough for plinking purposes. And all of this from a really eye catching all metal licensed Makarov replica. Another nice Legends Series CO2 BB pistol from Umarex.